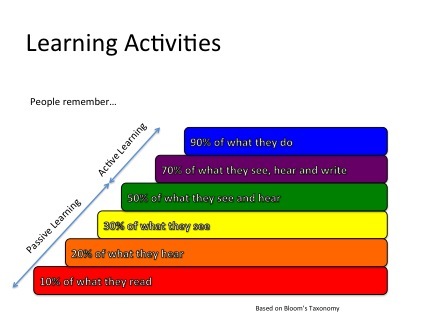 Learning experts have come a long way in understanding how adults best learn. What is becoming clear is that companies can achieve far greater employee development by shifting learning initiatives away from traditional ‘one-way instructor-to-student’ formats towards ‘participant-centric learning’ that emphasizes independence, self-direction, and problem-solving. SyNet has developed a set of guidelines in this area that we are eager to share. Participant-centric learning involves designing developmental activities that move people from simply acquiring facts and information (knowledge) to applying, analyzing, synthesizing and evaluating what they learn. The goal is to use learning to help employees develop the higher level thinking skills that are required in today’s business environment. The first image here on the left shows the progression or hierarchy of thinking skills known as Bloom’s Taxonomy. Creating a participant-centric environment requires abandoning the idea that knowledge is held uniquely by an “expert” teacher whose job is to transfer facts to a passive audience of students. While this may create a body of shared information, it does not engage students nor provide them with opportunities to use the information to elevate their thinking skills or to interact with each other, challenging assumptions and coming to conclusions. We want participants to be encouraged to validate their own thinking, develop their own conclusions, and align on answers with their peers. We create a learning experience that moves participants from passive learning to active learning by incorporating a variety of learning methodologies that engage them in a variety of ways. We aim to achieve a blended technology approach that creates an intense, personal learning relationship among a global, multi-local community of learners and faculty. We do this by combining live-streamed classroom sessions and mini-lectures with highly interactive small-group conversation practice sessions. Social media-supported conversation spaces are used to continue the classroom dialogue between sessions. 2. Deep dives into inspiring local, regional and global innovation. We create deep dives–total immersion journeys (actual, not virtual) that allow the learner to feel and empathize with multiple new perspectives in their thinking. We seek to connect the learner to a global web of inspiring living examples that can help enlarge thinking about their critical challenges in new ways. The capacity to facilitate thinking processes of profound innovation is grounded in mindful leadership and awareness-based leadership technologies that link the intelligences of head, heart, and hand. We work with our clients’ leaders so they can learn how to blend these methodologies with state-of-the-art organizational learning tools with participatory innovation techniques. One of the most important mechanisms for holding a space for deep learning is a peer-coaching circle that uses deep listening-based coaching practices. A peer-coaching circle consists of five to seven members who use a version of the case clinic process in which an individual presents a case or situation, and the group of peers or team members assists as consultants in developing concrete and innovative ideas of how to deal with the situation. We have students participate first-hand on the frontlines of innovation by challenging them to co-create real-world solutions for a specific group or stakeholder constituency. These projects are embedded in and guided by a global network of mentors and change-makers who collaborate with the students to develop actual prototypes or models. 6. Individualized lifelong learning journeys. We view the classroom as global, where students learn to sense and actualize their emerging future, which is the real curriculum. We ask to design their own curriculum to awaken, activate and strengthen their capacities to be intrapreneurs. At SyNet, we believe everybody is curious and motivated to learn and everybody has his/her own pace and preferred learning style. Our mission is to pass the responsibility of the learning process on to the learner, rather than on the facilitator. This creates the flexibility, applicability, and interest necessary for participants to be motivated to learn on their own. While traditional programs create a common experience to which all participants must adapt, we aim to create an individualized experience for each person, albeit with common threads so as to be practical and consistent in implementation and learning objectives. We include participants in the design of their individual learning path and challenge them by taking on the roles of both: the learner and the people developer by training and coaching their peers as part of their learning experience. We build elective modules into a program’s structure and sequence so that participants may choose tracks that are of most relevance to them. We create self-paced and team-driven learning experiences, whereby the participants research, process, and teach one another content from their own experiences. 7. Iterative and ongoing learning processes. Introducing topics through common group experiences and activities, then applying in learning teams. Assessing learning and application through mini-simulations and live practices. Building alumni involvement into active cohort programs. Acting in the role of adjunct or co-facilitator for facilitator-led modules. Leading “Lessons Learned” debriefing sessions with participant learning teams, peer case study groups, and other participant-centered sessions.